Synopsis: Ikuo and Tatsuya are orphans. They live at Mahoroba’s house which is a child and family services home. At their elementary school, they see Teacher Yuko, who took good care of them like a real older sister, killed right in front of them. 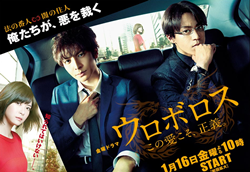 Ikuo and Tatsuya tell the police what they saw, but the case is covered by a police officer wearing a gold watch. 15 years later, Ikuo now works as a detective. He is a good person and his arrest rate is the highest at the police station. Meanwhile, using his handsome appearance and cleverness, Tatsuya becomes a high ranking yakuza. Detective Ikuo and Yakuza Tatsuya have a singular purpose, which is to find the man wearing the gold watch, dig out the truth and reveal the dark side of the police organization.